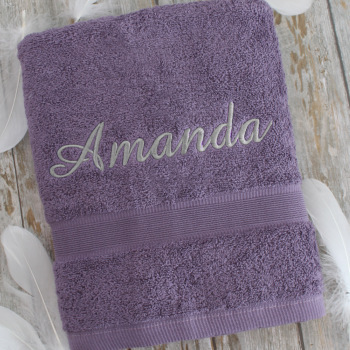 Personalised bath towel in a fashionable aubergine purple shade. This 125 x 70cm bath towel is made from soft cotton. A lovely gift for yourself, family or a friend. Select from the options and have this towel custom embroidered with a personalised name, initials or nickname. Your choice of thread colour and letter font style to be embroidered. Personalised gifts are custom made to order in the UK - usually within 2 working days.